At Tuesday night's Democratic primary debate, one of the first questions self-identified democratic socialist Bernie Sanders was asked was how "any kind of socialist" could win an election. Sanders responded by first explaining what the term actually meant, which was met with strong applause. Interestingly enough, Sanders' definition of democratic socialism has arguably attracted millennials more than any other group. When you look around the world, you see every other major country providing health care to all people as a right ... You see every other major country saying to moms that, when you have a baby, we're not gonna separate you from your newborn baby ... Those are some of the principles that I believe in, and I think we should look to countries like Denmark, like Sweden and Norway, and learn from what they have accomplished for their working people. It should come as no surprise that Sanders is increasingly becoming the candidate for millennials, rather than for an older demographic. A decade ago, his campaign would probably not only meet with failure, but also result in many Americans writing him off as a "crazy commie." While millennials weren't alive during the Cold War and have almost no recollection of how deeply international tensions influenced our outlooks on different economic systems, Baby Boomers and Generation X'ers lived while our cultural understanding of socialism was marred by the failures of the Soviet Union. As The Washington Post points out, the success of Sanders' campaign despite his openness as a socialist is "due to a mix of good politics and great timing." More than two decades following the conclusion of the Cold War, ingrained paranoia regarding anything anti-capitalist has largely disappeared from society, and historians have also increasingly recognized that the Soviet economy was just one of multiple models of socialism. The low poverty rates in European social democracies like Sweden (nine percent) and Denmark (5.4 percent) which Sanders frequently references are also to his advantage. Arguably Sanders' strongest appeal to millennials rests in his stance on free public higher education. His socialist platform also entails free national health care, but as 18-to-34-year-olds have watched tuition dramatically increase over the past few years and have come to fear impending student loans and debt, Sanders' stance on free education is more enticing for obvious reasons. In previous generations, a summer job could sometimes pay a college tuition, as the Seattle Times reports. For example, in 1981, tuition and fees at the University of Washington totaled $687. The threat of student loans and years of debt naturally weighs more heavily on millennials than on any group before them, and it makes sense that affordable education is a critical political issue to them. With free college part of its package, Sanders' socialism arguably has more appeal than Democratic frontrunner Hillary Clinton's plan for affordable college within a capitalist system. Stanley Kurtz, a conservative scholar and author of Radical-In-Chief, actually proposes a sound theory about the appeal of Sanders' socialism. According to the Huffington Post, Kurtz points out that many conservatives, who include former Texas governor and presidential candidate Rick Perry and even 2012 Republican presidential nominee Mitt Romney, have either disdainfully associated President Obama with socialism or outright identified him as a socialist. Because of this, Obama's millennial supporters, who have arguably grown accustomed to viewing policies conservatives dislike in a positive light, could have been conditioned to understand socialism as something favorable. Ultimately, another reason Sanders' brand of socialism is appealing is that he focuses on health care and education while refraining from delving into the historical values of "pure socialism." Sanders does not talk about the government taking over private industries. Nor does he develop stances on workers' cooperatives and limiting investor control of corporations. Instead, he focuses on developing a moderate model of socialism favorable to Americans who have had limited exposure to anything but capitalism. Sanders primarily emphasizes free health care and education, a fair and balanced distribution of wealth, and making the top one percent pay its fair share. 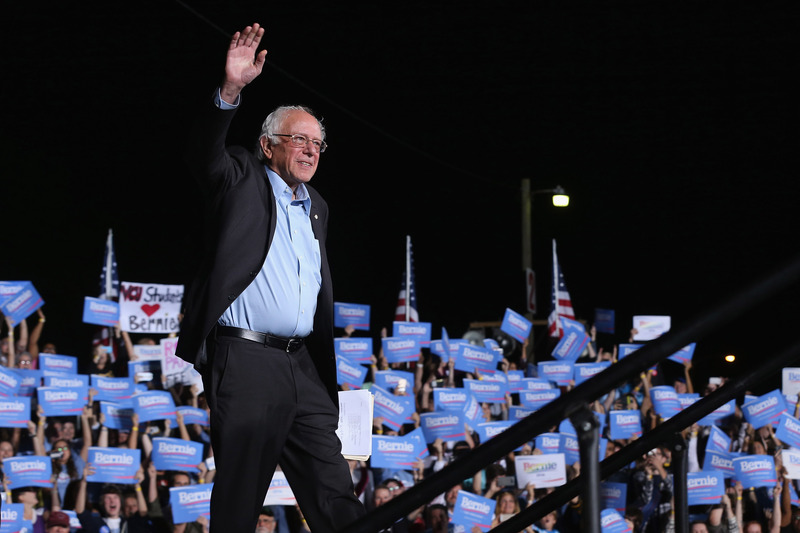 It could be argued that Sanders is promoting a social Democratic platform, and is running as a social Democrat rather than as a democratic socialist. According to Vox, Karl Marx coined the term "democratic socialist" for a left-wing party in France with policies not as radical as his own. Social democracy, which Sanders is specifically campaigning, utilizes representative democracy rather than revolution to achieve its goals toward economic equity. This raises the question of why Sanders is so adamantly running as a socialist, rather than as a "social Democrat" — especially given polling that indicates 50 percent of Americans wouldn't elect a socialist president under any circumstance. Ultimately, it may be that Sanders believes his appeal to millennial angst is rooted in his sharply anti-establishment profile, and he recognizes this as consequences of his explicit use of the word "socialist." And it may be that he isn't about to underestimate the political power of millennials in this election season.